This historic landmark offers visitors year-round recreational opportunities and hosts government and Legislature staff and MLAs. Location, visiting hours and other information about visiting the Edmonton Federal Building. This gracious architectural landmark has taken on a new life hosting public activities, government and Legislature staff, and MLAs. Request a space on the 11th floor of the Edmonton Federal Building, for business meetings or events. The Edmonton Federal Building is located on the northeast corner of the Alberta Legislature grounds. It was originally built by the Government of Canada to host its main federal offices for Western Canada. Based on a 1939 design and constructed in the late 1950s, this 11-storey Manitoba Tyndal Stone structure is considered one of the city’s most significant modern buildings and one of the best surviving examples of art deco design in Canada. 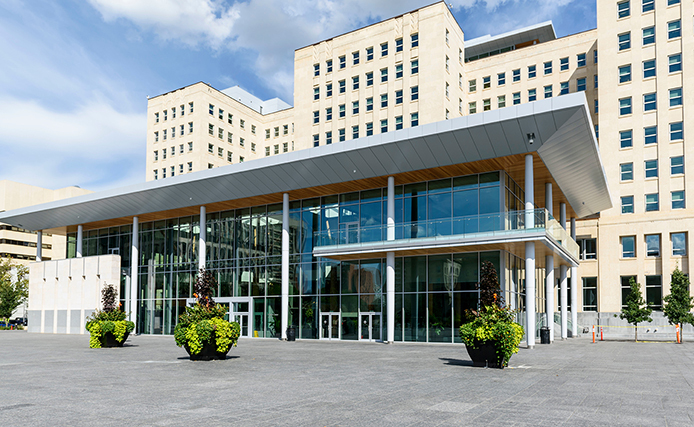 The Edmonton Federal Building is open year-round to the public. Visitors can view the building’s historic architectural details, its outdoor plaza with fountains and gardens, and the main floor visitor centre. Some meeting rooms located in the Edmonton Federal Building are used for government and non-for-profit organization functions. They’re not available for private events such as weddings. Wedding photos may be taken in the plaza and gardens outside the Federal Building. Bookings aren’t required. As such, groups taking photos can use the grounds on a first-come, first-served basis.